There is blood in the media water already this year, as The Huffington Post cut its HuffPost Live operation and Al Jazeera has shuttered Al Jazeera America, reportedly leaving as many as 700 journalists jobless. Now BuzzFeed is making changes as well. 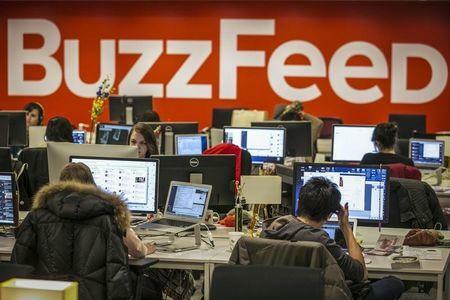 The hot media startup is "consolidating" two sections, Buzz and Life, and rolling them into a group called BuzzFeed. It is also combining its social, app, and homepage teams into a group called News Curation. In addition, six BuzzFeed editorial staffers in New York were let go or left this week, Yahoo Finance has learned. A spokesperson for BuzzFeed says these exits are not related to the restructuring, and that they are examples of "regular attrition," not layoffs. The company, which has more than 500 editorial employees globally, is still undergoing its 2015 year-end performance review process, which began in December. Some of the staffers who were let go this week were not told why they were being fired, sources tell Yahoo Finance. Four former BuzzFeed employees, speaking to Yahoo Finance on the condition of anonymity, say that this is commonplace at the nine-year-old company, where management has continually reorganized to accommodate growth. BuzzFeed has a recurring public forum where employees can submit questions to editor-in-chief Ben Smith and publisher Jonah Peretti. "People keep submitting the question, 'My co-workers keep disappearing, why is that happening?'" says an employee who recently left. "And Ben says, ‘That doesn’t happen here, anyone who is let go has gone through months of performance reviews, they’ve been put on notice, they know why they’re being let go.’ That is just not true." Indeed, in an all-staff email from 2014, obtained by Yahoo Finance, Ben Smith addressed this problem. "What we try to do, and will try to get better at: Make sure things don't come out of a blue sky, and if things aren't working, that you know from your editor that there's an issue and you're trying to fix it,” he wrote. According to multiple sources, this is still an issue at the company: writers are frequently cut without warning. BuzzFeed declined to comment on this subject. Last year, NBCUniversal invested $200 million in BuzzFeed. The company has placed an emphasis on video ever since launching BuzzFeed Motion Pictures in 2012, but in the past year, recently departed employees say, it has emphasized video like never before, which created a shift in focus. "They were focusing heavily on editorial and the social-sharing side, as opposed to video, and now they are suddenly channeling all their energy into it," one source says. "So they have had to consolidate a lot of edit people. I expect they will fire a bunch of young kids this month." Smith sent an internal memo to BuzzFeed employees on Friday morning about the reorganization. BuzzFeed shared the memo with Yahoo Finance. The changes, Smith said in the memo, are about "making sure we are smart and organized about how and what we publish, and that we are positioned to work seamlessly with other divisions of BuzzFeed and other BuzzFeed teams around the world." Smith added in Friday's memo that he was "deeply grateful at the attitude with which virtually everyone I've talked to has received this: Not the defensiveness around change that would be natural, but constructive suggestions about how we can work better together, inside editorial and as a global company, as we move into a world where the web is just one of the places we operate, and posts are just one of the things that we publish." Yahoo Finance will update this story as we learn more about changes at BuzzFeed.